Sixty-six years ago, in 1952, Clifford “Bill” Marlatt built an airport with a 2,350 foot grass runway. Bill, now 91 years old, was on hand Saturday as a new 4,200 foot runway on County Road 400 South in New Castle was dedicated despite rainy weather and overcast skies. 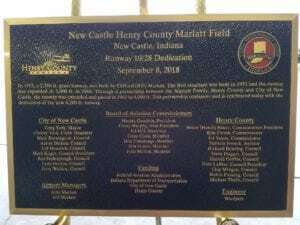 A plaque bearing the new name, New Castle Henry County Marlatt Field, was unveiled during the festivities. The plaque was made possible by the New Castle-Henry County Board of Aviation Commissioners (BoAC) and Hinsey-Brown Funeral Service. It lists representatives involved in the expansion process, including city and county officials, airport managers, those on the BoAC and engineers. Corey Murphy, president and CEO of the New Castle-Henry County Economic Development Corporation, who also serves on the Board of Aviation Commissioners, spoke during the dedication ceremony. “It’s a bad day for flying,” he said of Saturday’s weather. Surrounded by family, Bill said becoming a pilot was one of his proudest moments in life. And his favorite plane to fly? That would be an Aero Commander, which is a twin-engine cargo and passenger plane. Many members of the Marlatt family were present Saturday, along with friends, elected officials and government representatives. John said having his dad present for the dedication ceremony was the most important part of the day. The airport’s goal is to expand the runway to 5,000 feet or more, which will allow for increased commerce in the community, according to Maurie Goodwin, who serves as president for the New Castle-Henry County Board of Aviation Commissioners. During the dedication, Murphy read a letter from U.S. Senator Joe Donnelly, who was unable to attend. The airport is located three miles southeast of New Castle at 2912 E. County Road 400 S. For more information, call (765) 529-7903.